...Enjoying Life...: Altenew Color Therapy Blog Hop + Giveway! 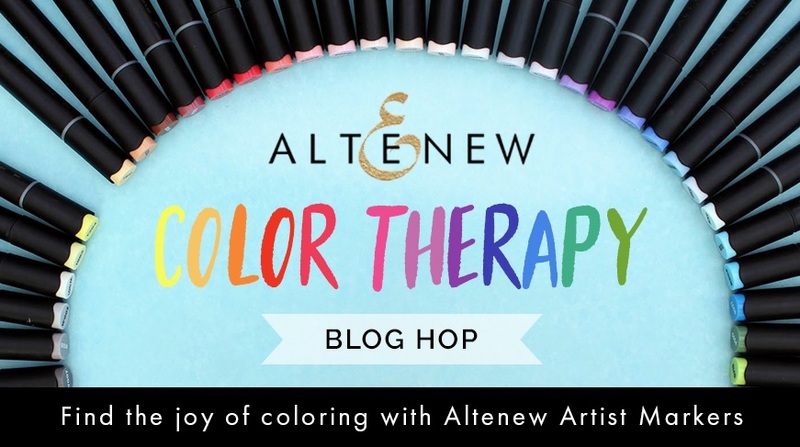 Altenew Color Therapy Blog Hop + Giveway! Welcome to my stop on the Altenew Color Therapy blog hop! I'm so happy you're here! You should have arrived from the fabulous, Altenew Scrapbook Blog. If you want to start at the beginning of the hop, click here and you'll be taken to the Altenew card blog. More prizes!!! Altenew is such a generous company! They are allowing me to also give away a $20 gift certificate to one lucky winner from this blog post! Just leave a comment below. I will announce the winner on my blog on 7/18/2018. We are all excited to share our creations using Altenew's Artist Markers! I was able to play with them for the first time and had so much fun! They have lots of pretty color choices and they blend beautifully! I've added links below, not only for the markers I used on my card, but for each set that Altenew sells, in case you're interested. Altenew also has all their Artist Marker sets on sale starting today, through July 15! Yay! What a perfect time to give them a try if you haven't done so already! Just use the code: HAPPYCOLORS. So I decided to use the gorgeous, Amazing You set from Altenew to color with their Artist Markers. Here's my card. I love a pink and green combo, in case you haven't heard - lol! So obviously I loved coloring these pretty images! It's a one layer card, with the exception of the sequins, and a very simple design but I love how it turned out! Hope you do too. The next stop on the hop is the amazing and talented Emily Midgett. I can't wait to see what she's created! so pretty - Love those bright colors. Lovely card! So bright and cheerful. Your cards always bring a smile. This one is just lovely. 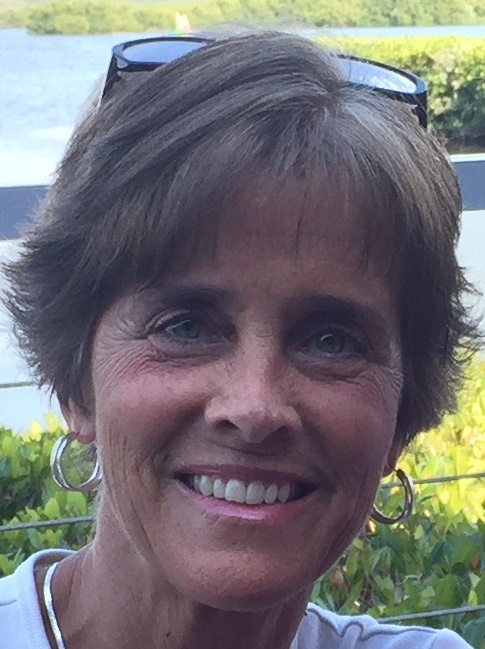 My goodness...you sure know how to bring those flowers to life with your beautiful coloring, Barb! Gorgeous card! beautiful card. I love the vibrant color. I LOVE THE VIVID color! Beautiful card....loved the colors.....sometimes these blog hops just leave me speechless with the amount of talent you ladies possess....thank you so much for sharing your awesome card! Pretty, pretty card - nice coloring too. Such beautiful pink and greens! Am so amazed by the vividness of these Altenew markers!! I too LOVE the pink and green combo! You make it look effortless! YOU ARE AMAZING and This card is AMAZING! I love how you colored it to look like shadowing all over! So GORGEOUS!! Very pretty and beautifully coloured! So simple & so, so pretty!! My kind of go to card..love it!! Barb, your card is lovely. The leaves on those roses just light up! A beautiful combo of color therapy! Bright and gorgeous flowers! Really love the coloring on those leaves! Pretty card. I love how you did the leaves. Beautiful card! The pinks and greens are lovely together, and the highlights on the leaves are gorgeous! I also love the pink and green combo! I think it looks wonderful! I think your card is beautiful. The colors you chose are amazing. Thanks for the inspiration. Very sweet and beautiful card. Thanks for the great inspiration! Beautiful rich colours Barb. A delightful card. Yes... 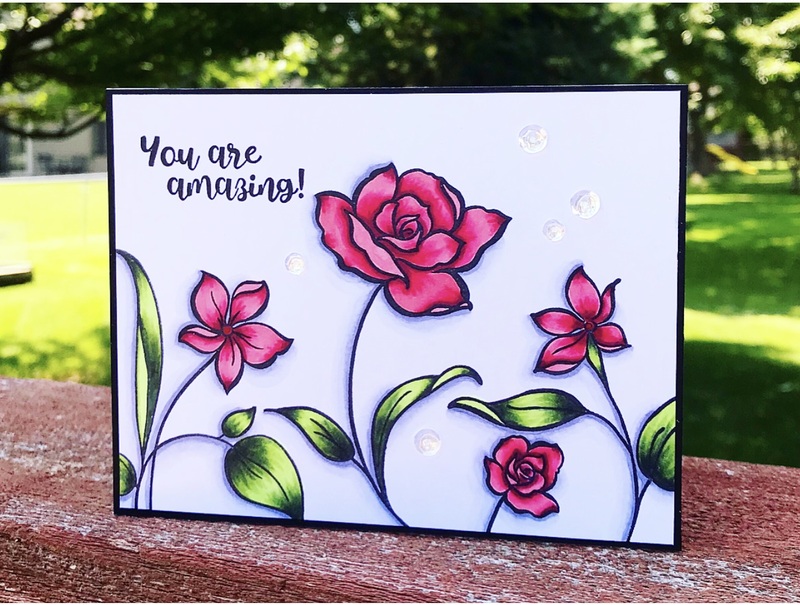 Your card says it all... Amazing! This is simply beautiful Barb, your colouring/shading is amazing! My fave part about these markers is that they come in packs so you don't have to wonder which colour goes with what. Love that! I love your card. The colors are so vibrant and rich! Such a vibrant and happy card. Some-one is going to love this. Very lovely card! Simple and beautiful! Such a pretty card! Love the CAS cards! Thanks for the inspiration! Beautiful card and I love the colors of the flowers and leaves. So pretty! Beautiful card. I love the purple shadow around the image.. This card is beautiful. I love the gorgeous flowers and the colors used. Gorgeous card, Barb! Love the pink and green combo. These markers are such fun to use for coloring, aren't they? Fresh and beautiful card! Wonderful composition and lovely coloring. So pretty! Love these gorgeous flowers! I never realized the beauty of color therapy. It has been a lovely inclusion to my world. Thank you for your inspiration. Beautiful OLC with amazing coloring, I’m a fan of the pink and green too! Beautiful card, I love the bright colors. Thank you so much for sharing. The flowers appear to be jumping right off the card! Beautiful coloring! Such a happy card. So pretty in pink and green. Love the clean look and pop of red! Fabulous card card and love the coloring! Your design is very pretty Barb, love those flowers and the sparkle. Thanks for the inspiration! What a perfect time to give them a try.